Exclusive Sean Gregan Preston North End column: Goals came along like London buses! You could say that Preston North End’s goals against Queens Park Rangers came along like London buses. This was a third away win of the season, the other two being 1-0 at Bristol City and Nottingham Forest. So to go to Loftus Road and score four made for a great afternoon’s work. An important aspect of the win was that two of the goals were scored by lads who have only just arrived at North End. Jayden Stockley and Brad Potts were on target in what was their second game. Being a striker, Stockley will get judged by goals so to get off the mark so quickly will have been a big thing for him. Defenders and midfield players tend to get a longer settling-in period when they join a new club. But with strikers, straight away they are being looked at and an immediate return of goals is expected. Stockley can tick his first goal off the list, be pleased with that, and play without the pressure. Being a midfielder who likes to get forward, a few goals will be expected from Potts. So again, he will have been pleased to have got off the mark. I would think that the scoreline at Loftus Road would have taken quite a lot of people by surprise. QPR have been going well, having recovered from a bad start to the season. So for PNE to have gone there and got the win in the manner they did, might have led to accumulators being torn up. When I was playing, I found Loftus Road a difficult ground to get something at. It is an older stadium with plenty of character and it feels like the crowd are right on top of you. The attendances might not be as big as some but the fans can generate a decent atmosphere. Yet it would have been the Preston supporters singing on Saturday – it was a good day out in London for them. There is now a 10-point gap between North End and the bottom three. While I don’t think they will get dragged down into a relegation scrap, the more points they can put on the board as quickly as possible the better. That way they can have a look at the teams above them over this second half of the season. 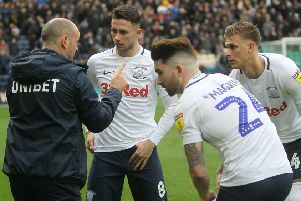 I wrote last week that the gap to the play-offs looks too much for North End to claw back, so the aim has to be to play well over the coming months and finish strongly. The injuries have started to clear up and with more players available to Alex Neil, hopefully we can see more results like Saturday. It is another away day for PNE next against Stoke. In my time at Preston we had a few battles with them, a couple of high-scoring games at Deepdale. Down at their place it was always a tough game and the stand-out was a 1-0 win on Boxing Day when Michael Jackson scored. Stoke have just got a new manager, they beat Leeds on Saturday, so it should be a good game next weekend.